A huge number of not standardized fashion products, not harmonized sizes and quality of production are a danger for gaining access to the global market. SWOT analysis can be of a special importance in apparel manufacturing industry when used for designing a new article of clothing, i.e. collection. This article has presented a details discussion on SWOT analysis of apparel industry. It provides the SWOT analysis to be based on the experience, knowledge, skills, attitudes and beliefs, because all the observations and personal feelings have an impact on the SWOT. Marketing managers often confuse features and advantages or disadvantages and risks, because the line between them is sometimes invisible. 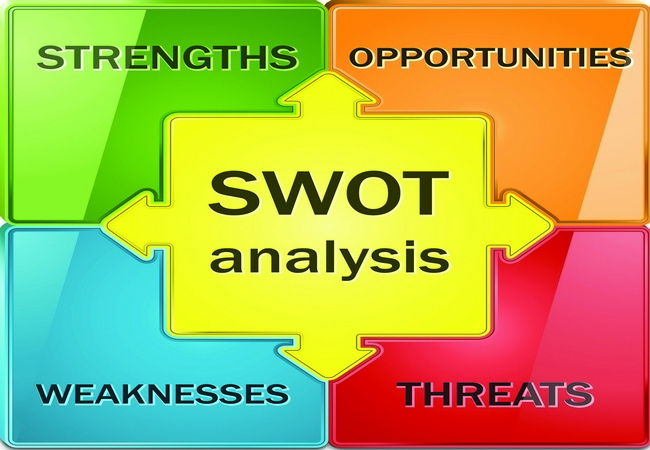 Certain key elements of the SWOT analysis are often so difficult to estimate. Because, some points are slower than others. Therefore, it is necessary to use percentage participation. Weakness -2 = 70% and weakness-3 = 10% (total 100%). Many details, reasons and justification have been omitted in the SWOT analysis. For example, the technology itself is often both the weakness and the advantage. All the facts presented in the SWOT analysis have the impact on the strategy and that is why it is necessary to classify (rank) them from the highest to the lowest impact and thus determine the priorities. Then the marketing plan must be identified according to the following priorities (the opening of “show room”, new creations, placing new products on the market, etc.). For ranking and setting priorities a Gap Analysis can be used, a simple and effective analysis that enables marketing managers to decide upon the appropriate strategy and tactics. Short time for optimization of products. Production of garments Made-to Measure. How to Control Apparel Production Cost in Garment Industry?